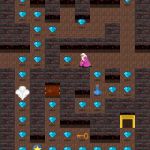 A brief summary of development progress with our HTML5 game projects. Lots of work gone into balancing the action in Akari. Alien bombs, laser power and frequency of formation attacks all addressed. Work started on the background artwork – heavily influenced by Toaplan’s Outzone. Added 2 new formations that allow for aliens to fly in diagonally, curl around and disappear stage left (or right). Chaos Grid now available on the AppStore following updates to use the Nitro Engine in WKWebView. 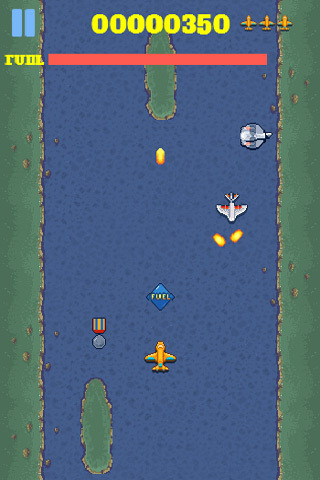 Thunder Gun development now includes modified aircraft behaviour and a mini mid-level boss battle. Thunder Gun settings tweaked to improve gun rate on player’s plane. Increased alien bombs. More challenging gameplay and more intense. Re-worked some graphics. Hero is now a Squirrel and collectables are now hazelnuts and fruit. Improved bonus item generation. More of a challenge for the player and also more rewarding! Improved touch control on Bouncy. No more running off the end of platforms in search of targetx! Added circular laser bolts. More pleasing on the eye than rectangular lasers. Putting some long-overdue work in to Distant Orbit. Game’s design is taking shape nicely. Will implement save / resume functionality. An early performance demo of the game can be seen on You Tube. Distant Orbit performance demo. Implemented the tree/obstacle collision and decreased the player’s heart count. This is essentially player lives but I don’t break up the play. Instead I set Santa to be immune for 5 seconds whilst the player moves him out of harms way. “Shotgun Santa” game has structure and graphics. Have finished work on Dungeon Adventure but now need to figure a better way of releasing the game on this web site. Started work on a new game earlier. Need to add the ability to NOT re-draw all gems when player loses a life. Store gem index in a simple array with a flag for ON or OFF. i.e. collected or not. It’s really tiresome to have to retread the entire dungeon when all but 2 gems have been collected. Created a short game video for Castle Quest and put it on you tube. Looking to complete the game in the next couple of days. Considering taking Castle Quest in a slightly different direction by adding an RPG element. I’m really not sure how this might work just now but since I am controlling a Wizard it could be a case of controlling spells and managing Mana levels. It’s a heck of a change for something that is 95% complete just now. Needs some serious thought. Right now it’s basically PacMan in a fantasy dungeon setting. Took a look at Rich’s (Photonstorm) new game today. It’s going to help turn people around to mobile web gaming. Great little game. 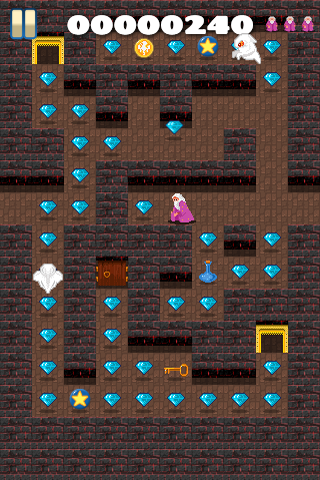 Having some major re-thinks about the way I implement levels in Castle Quest. Might consider mixing it up a bit and having some strategy to the dungeon layout. Why must I keep having these ideas when I’ve got so close to completion ?? Changed the way the freeze potion affects the monsters. Previously the freezePotion property was attributed to the player but this is just wrong. Instead attributed to each visible monster such that I can apply effects to them. Works a treat ! Had a play with some monster graphics last night with varying degrees of success. The angle at which the game is played is causing me an issue. Although it’s a top-down game and the player’s Wizard is presented as if faced “almost” head-on I can’t seem to find the right presentation for the monster sprites. I took my lead from Gauntlet for the Wizard so will look to that game again for inspiration. Scribbled some thoughts down for improving the monster movement / behavior in Castle Quest. I’m getting a number of emails from Google telling me that my AdWords campaigns are performing pretty well. I specifically target Free Mobile Arcade Games and derivitives thereof. I really should consider a budget for AdWords each month. Trouble being that the last £100 (donated by Google) was exhausted in under a week and I just don’t create enough money through advertising. £100 spent certainly didn’t generate £100 return. Had some thoughts regarding Castle Quest‘s structure on the way in to work. May now consider the unlocking levels approach made famous by Angry Birds. Saved out to localStorage this could be a neat feature for gamers to quickly pick up and carry on rather than simply starting at level 1. Need more hours in the day to be implementing this stuff. Thoroughly enjoying reading through Jordan Mechner’s The Making of Prince of Persia .